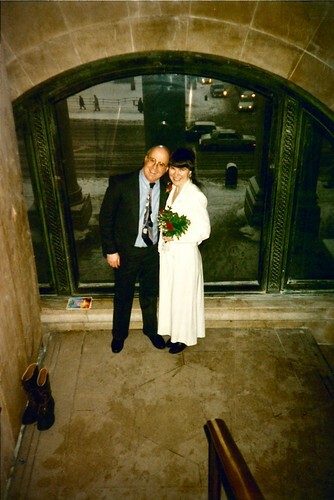 February 16, 2016: It was 20 years ago today, I married my sweetie Peter on a snowy day. happy 20th to you, Irene, and your husband Peter!! Hooray! Congratulations on twenty years. May you enjoy many, many more. Did you go with china or platinum? Thanks Santos, Van, Ken, Robert and Martha! Peter's joining me to program some music tonight. And Listener Robert, Peter's the one with the big smile! Todd Rundgren at his best! love this - if i were the president of general motors i'd buy a toyota. Love to you both. Fabulous show Irene. Hey! Snowy day 20 years ago; rainy windy day today. Congrats! Thanks Tom, dale, Trudy, Jake and LilyAbigale! We're appreciating all the kind thoughts. And go ahead, bring on the mush. Thanks Cliff, Tommy, ScottC, neilwarren and KP! Glad you're all here to share the love and mush. Sliced - not sliced - who cares when you are in love. ScottC, you're lucky no matter what! awww Sweet just overheard in the car , now seeing the playlist page now Congrats Irene and Peter ! yea keep it mushy ,, lovin' it ! 22 Fillmore -- now you've got me thinking Dashiel Hammett. Thanks Summer and Michael, Tome and Chris M. Basking in the love glow. Thanks Irene. Again, happy anniversary. Duty calls. And by duty, yeah, bed. I slid over 70 ft down a hill this morning on pure black ice trying to get to work. After caving in my head and hurting my back I gave up. It's been a day. See ya on archives. Tschuss. Better check the back alley, ScottC. Ouch, Van! Take care of those aches and pains. Van, I hope "caving in" was an exaggeration! Vehicular or ped? Please feel better soonly. Thanks for listening, folks, and thanks for the comments. I really do hope we're not too mushy for you -- we just can't help it! thank you for playing this McCoy Tyner, I've never heard of him and now want to see him at the Blue Note on mar 1! You really should, Joe. McCoy's playing is still decent, and he has the great Gary Bartz playing sax with him. Joe, if you've heard John Coltrane you have probably heard Tyner on piano. Thanks Dave and Irene! I've got some listening to do! I should clarify, if you have heard Coltrane as a band leader, you have probably heard Tyner. Good evening and happy anniversary! I liked the Oregon. Yeoowwch! VanInDC: I hope you are doing better. Jesus. Work is not that important. Except for the money and insurance it can provide to care for you… But… Yeowch! Take care! No lie, Mr. Keepnews, Irene = 1 of WFMU's all-time great d.j.s!! God bless on your anniversary, you coupla krazy kids!! Aww, you make me blush Listener Sned! Thanks, Irene and Peter. Nice mix of instrumentals and vocals tonight. Best of luck in the future. Thanks for all the great comments, and for helping us celebrate our 20th anniversary! Catch you all next week. Goo night, people and chopped liver! Happy Anniversary, Irene and Peter, the choice of music was sublime.